Orientation is a valuable time before you begin classes. There will also be times for fun and meeting other students and local community members! During orientation, you may be asked to take placement tests. These tests help place you in the best classes for your ability level. This may take several hours. For ESL students, the test will be given in part on a computer, in writing and in person. New academic students who do not have an ACT or SAT score may be asked to take the Accuplacer. This placement test will determine which English and Math courses the student is eligible to take. The Orientation Week dates are listed on your admission letter and in emails from Ms. Cala Flippo, Student Services Coordinator and DSO/ARO. Need a reminder? Email oiaservices@una.edu. Your attendance is mandatory. Please book your air travel tickets to arrive on the correct days. 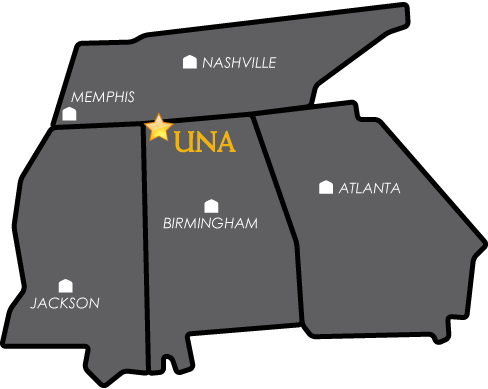 Click here for a list of the various student organizations to join at UNA!